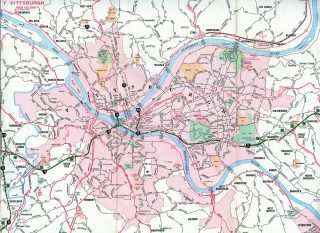 Interstate 579 is Crosstown Boulevard in Pittsburgh, an urban freeway spur from Interstate 279 on the North Shore to Downtown and the Golden Triangle. The highway crosses the Allegheny River along the Veterans Memorial Bridge to the north and ends at the approach to the Liberty Bridge above the Monongahela River to the south. The route concludes just shy of Interstate 376 & U.S. 22-30 (Penn Lincoln Parkway East). The connection with Interstate 376 is not a full interchange, and thus the route is an odd-digit spur as opposed to an even-digit loop. 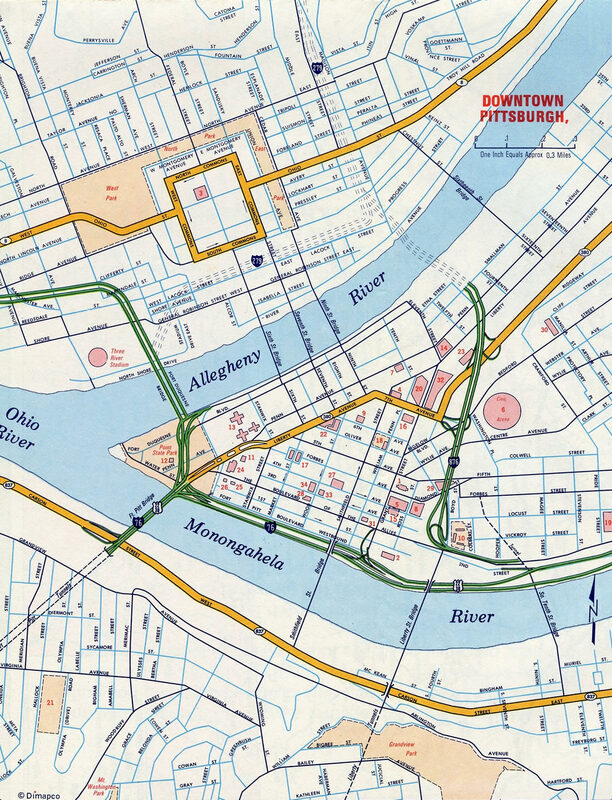 The urban freeway was originally planned as a complete loop and designated as Interstate 479, as current I-279 along Parkway North represented the planned I-79 mainline at that time. Interstate 479 was renumbered as Interstate 876, when I-279 and 79 traded places as approved by AASHTO on June 30, 1970. The designation changed again in 1971 to I-579, as the freeway would not directly connect with newly designated Interstate 376 along Penn Lincoln Parkway east. Looking south at the Veterans Bridge from Three Rivers Heritage Trail on the north banks of the Allegheny River. Photo taken June 13, 2010. 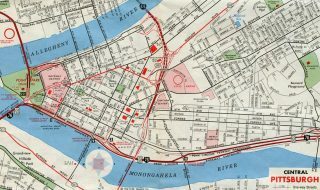 An interchange was planned for the south end of Crosstown Boulevard and Penn Lincoln Parkway East in 1950.2 It was never built. Interstate 876 was redesignated as Interstate 579 as approved by AASHTO on December 3, 1971. The actions for I-579 were coupled with the renumbering of Penn Lincoln Parkway East to Interstate 376 and the renumbering of Interstate 80S as the new I-76 mainline from northwest of Pittsburgh to near Seville, Ohio. 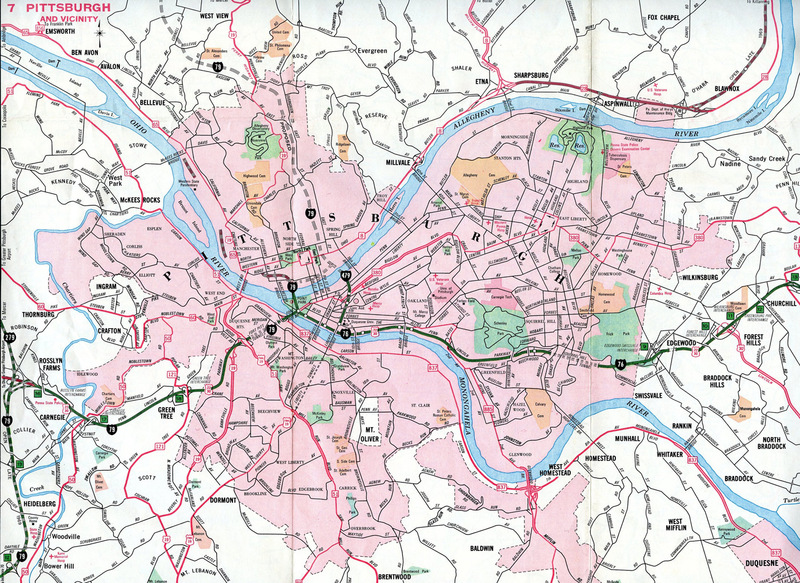 Gousha map of Downtown Pittsburgh, showing Interstate 876 along Crosstown Boulevard. An HOV roadway lines the inside lanes of the Veterans Bridge as Interstate 579 elevates over Pittsburgh Station and parking lots south of the Allegheny River. A wye interchange lies a quarter mile ahead with the PA 28 freeway northeast to Etna. Photo taken 06/14/10. Two lanes of Interstate 579 north default onto Interstate 279 north as a lane drop occurs for the Pennsylvania 28 northbound off-ramp. I-279 winds through the northern suburbs to directly merge with Interstate 79 ahead of Cranberry Township. Photo taken 06/14/10. An end Interstate 579 shield assembly stood beyond the gore point for PA 28 north to Etna. The empty brackets below the shield once held a north I-279 shield. The I-579 shield went missing after May 2012. Photo taken 06/14/10. The first in a series of overheads for the I-279 south wye interchange (Exit 2A) with Interstate 579 and the Veterans Bridge precedes the high-level Swindell Bridge. Photo taken 06/14/10. The two-lane reversible roadway also partitions with ramps for Interstate 579 and the Veterans Bridge, affording commuters direct access to Downtown and CONSOL Energy Center, home of the Pittsburgh Penguins NHL franchise. Photo taken 06/14/10. Pennsylvania 28, a freeway straddling the northern banks of the Allegheny River northeast to Harmar Township, ties into the exchange of Interstates 279 and 579. There is no direct access to PA 28 north from I-279 south. Instead motorists are directed onto East Street (frontage road) south to Ohio Street east to make the connection. Photo taken 06/14/10. Interstate 279 separates with two lanes for the Veterans Bridge (Exit 2A) and two lanes for the continuation of Parkway North to the Fort Duquesne Bridge. The HOV roadway separates, with the I-279 lanes extending west to the PNC Park and Heinz Field area. Photo taken 06/14/10. Ten overall lanes of traffic flow underneath the North Avenue over crossing with ramps from Interstate 279, the Veterans Bridge and the reversible HOV roadways converging. 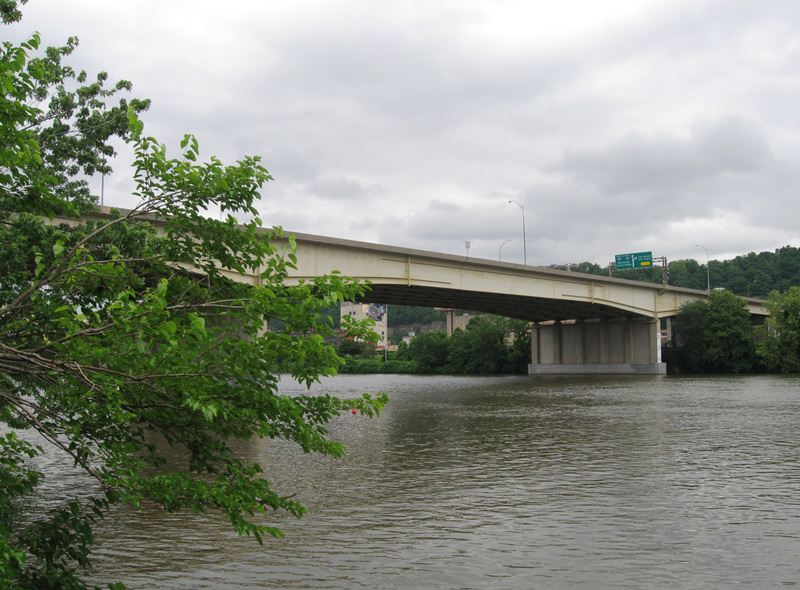 Interstate 579 angles southeast across the Allegheny River to meet PA 380 (Bigelow Boulevard) next. Photo taken 06/14/10. Pennsylvania 28 travels through the Troy Hill neighborhood of Pittsburgh to the exchange with Interstates 279 and 579. Improvements made to the PA 28 freeway by 2015 include a new concrete surface, a barrier median and exit numbers for I-279 (Exits 1B/A). Photo taken 06/11/10. The PA 28 freeway drops below grade through the East Allegheny neighborhood to the wye interchange for the Veterans Bridge (I-579) south and the flyover connecting with I-279 (Parkway North) south to the Fort Pitt Bridge. Photo taken 06/11/10. Traffic partitions into three ramps as Pennsylvania 28 concludes a 98-mile route from Brockway via an off-ramp to Anderson Street. Ramps to Interstate 579 south to Downtown and the Hill District opened a year before those linking the Allegheny River span with I-279 (Parkway North). Photo taken 06/11/10. 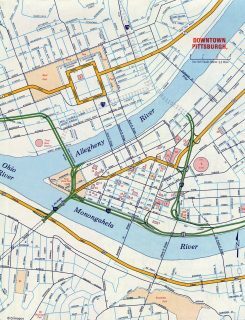 Interstate 579 travels below grade from PA 380 (Bigelow Boulevard) to Centre Avenue, where it elevates across Fifth Avenue to the Liberty Bridge north end and trumpet interchange with Boulevard of the Allies (PA 885). Photo taken 06/14/10. Traffic partitions into single lane ramps for the Liberty Bridge and Pennsylvania 885 (Boulevard of the Allies) south to Interstate 376 east as Interstate 579 ends. The mainline drops into a signalized merge with the Crosstown Boulevard ramps from 6th and Forbes Avenue ahead of the Liberty Bridge over the Monongahela River. Photo taken 06/14/10. A community interchanges identification sign outlines the three mainline exits from Interstate 579 north for Downtown Pittsburgh to northbound drivers across the Liberty Bridge. Photo taken 06/14/10. Approaching the Liberty Bridge north end, drivers partition with a single lane ramp for Boulevard of the Allies, which parallels Penn Lincoln Parkway East from Downtown to Duquesne University and an eastbound ramp to I-376 for Monroeville. There is no access to I-376 west from I-579. Photo taken 06/14/10. Two lanes descend from Liberty Bridge north onto Crosstown Boulevard for both Interstate 579 north to the Veterans Bridge and to 6th and Forbes Avenues in Downtown Pittsburgh. I-579 commences with a single lane below the Boulevard of the Allies overpass. Photo taken 06/14/10. This set of button copy overheads at the north end of the Liberty Bridge was replaced after 2009. The pull through sign was changeable, as the inside lanes of Crosstown Boulevard are reversible. Photo taken 10/01. There is no connection from eastbound Interstate 376/U.S. 22-30 (Penn-Lincoln Parkway East) to Interstate 579 or the Liberty Bridge over the Monongahela River. Here, Interstate 376 east passes under the Liberty Bridge. Photo taken 10/28/04. Exit 73A loops onto PA 885 (Bates Street) south to 2nd Avenue and Irvine Street as Interstate 376 & U.S. 22-30 advances 0.75 miles to a wye interchange (Exit 72B) for PA 885 (Boulevard of the Allies) north to I-579. Interstate 376 meets the Monongahela River for the first time on this stretch. The two will closely follow each other all the way to the Point, where the Monongahela River feeds into the Ohio River. Photo taken 09/30/10. A lane drop occurs at Exit 72B, which combines with the left-hand side of Pennsylvania 885 (Boulevard of the Allies) as parallels the north side of I-376 (Penn Lincoln Parkway East) to Duquesne University and a trumpet interchange with I-579 (Crosstown Boulevard) north and the Liberty Bridge south. Photo taken 09/30/10. A second wye interchange interlaces with Exit 72B to add traffic to Interstate 376 west from PA 885 (Boulevard of the Allies) north. Exit 72B is not a direct connection to Interstate 579 north, as it requires motorists to utilize the at-grade Boulevard of the Allies for one mile. Photo taken 09/30/10. The first signage for Interstate 579 appeared as then Exit 3A (old Exit 7B) departed from I-376 & U.S. 22-30 west for PA 885 south. Button copy signs here were replaced after 2007, following the extension of I-376 northward to Sharon and subsequent exit renumbering of the route. Photo taken 11/02/04. Penn Lincoln Parkway East drops below a retaining wall as it rides along the periphery of the Monongahela River to Downtown Pittsburgh and the Point. The freeway reduces to four lanes through the back to back wye interchanges with Boulevard of the Allies (former Exit 2B). Photo taken 11/02/04. Exit 2B partitioned from the westbound mainline of Interstate 376 & U.S. 22-30 for PA 885 (Boulevard of the Allies) north to I-579 (Crosstown Boulevard). Just above Penn Lincoln Parkway to the north is Duquesne University, a private, Catholic university that first opened in 1878. Its entire 40-acre campus is located on the Bluff, overlooking the Monongahela River and downtown Pittsburgh. Photo taken 11/02/04. “The Bridges of Pittsburgh: Veterans Memorial Bridge.” Pittsburgh Post-Gazette, July 21, 2013. Liberty Bridge – Bridges and Tunnels of Allegheny County and Pittsburgh, PA (Bruce S. Cridlebaugh). Liberty Tunnel – Bridges and Tunnels of Allegheny County and Pittsburgh, PA (Bruce S. Cridlebaugh). “Feds announce $19 million grant for Hill District, Downtown project.” Pittsburgh Post-Gazette, July 29, 2016. “Erroneous Penndot Sign Sends Wrong Signal to Visitors.” Pittsburgh Post-Gazette, August 4, 1991. 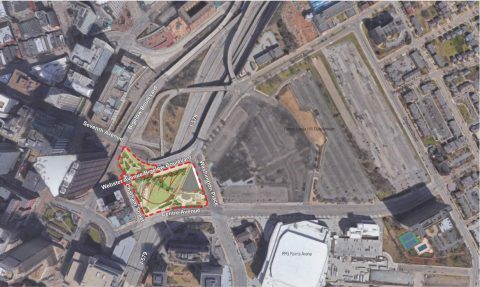 “Penguins Introduce “Center of Energy” Plan for Lower Hill Redevelopment.” Penguins News, March 8, 2019.